Transylvanian metalheads at HATEVIRUS have set the 1st of March 2019 for their debut studio album release. 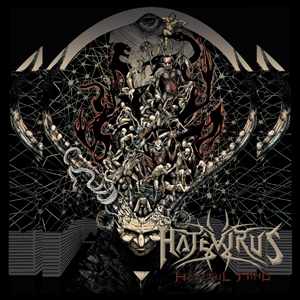 The album Hateful Mind, so far supported by two earlier released singles “Hateful Mind” and “ArchiteKt of HatE”, tracks on heavy rotation by metal radio podcasts and with best reviews from all over the metalhead press/blog community around the world. A tracklist that's not just a display of words, as an Official Album Teaser unveils excerpts of their music, artwork and never before seen shots from the making of “Hateful Mind” Official Music Video. Check out the album teaser video below. Available now for pre-order / pre-save on all major digital streaming/download platforms. For a long time The Human Nature has been under Attack, One invisible Enemy programmed to take over, control and finally destroy what WE are…this Enemy is a Virus with specific genetic instructions to find the Human host, infect and take over his mind, feelings and action control... The HATEVIRUS (H8V), and it’s what we have to fight against. This reveals that in our society, there is a virus of Hate causing many deteriorating symptoms and as a whole, suffering from the effects of Hate, be it individually, socially, politically or religiously. Hate is alive and growing constantly due to poor individuals of our human breed , weak enough to be infected. After the viral invasion The Plague is easily spread around by a complex set of actions that invite others to follow…concluding with the fact that we are the followers of Hate, Armies of Haters carrying evidence of a disease that had lead us to Involuntary Acts of Aggresion against others, up to where The Point of Recovery and fighting back will no longer be possible for all of us, falling into a dark abyss surrounded only by our guilt and confused feelings. No outside action or Viral e-Motions are to blame, only We are The Architekts of Hate and the generators of this Hateful world we live in today. The Viral Hate Infection is out there and WE are the Antidote. The Viral Hate Infection is out there and WE are its Followers. You won’t stand alone against this Plague...we have been here since 2011.